I am using the Dokan theme and have questions regarding the header area. On your demo page (http://demo.wedevs.com/dokan/?preview) you have a nice short search bar. I would like the exact same. Can you tell me how to get that please? I have a long stretched logo. It does not fit into the field that you have defined for logos and I need more space / length. Can you tell me what to change in the code please? 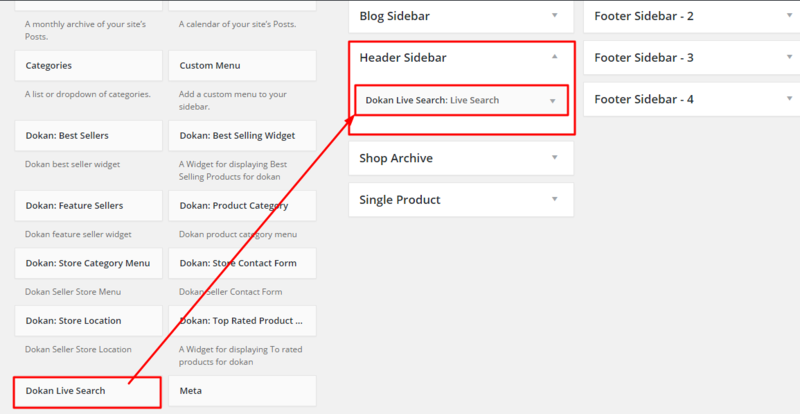 Drag “Dokan Live Search” widget in “Header Sidebar”. I have attached an image below. Increase height and width value for this attribute. The attributes are located in this style site-header h1.site-title a. And the style are located in theme/dokan/style.css file. This increase may extend the logo size. Can you try and let me know the result, please. Changing the CSS where you suggested (site-header h1.site-title a) does nothing unfortunately. There seems to be some sort of a box around it and I don't know where to change that. It cuts off half my logo. Maybe a bootstrap setting? Or something in the header.php? Could you please have a look because I don't know anything about code and I really need this website going. Thanks for getting back. My website is now live with vendors adding products so I don't want you to try out the code on the actual website – especially as I have already made a lot of other changes to the code that I want to keep. My logo's dimensions are: 346 × 60px. It does not fit and gets cut off. Could you please try to display this logo using one of your own trial versions. If you figure out how to fit the logo in the header could you please publish the code here for others to see? I tried myself but I don't know enough about coding. Send me the logo. I will check in my local server. Also send me your site URL as well as. Try this following code in themes/dokan/style.css and let me know the result. Unfortunatley your code didn't work. The logo is still cut off. There seems to be some sort of defining box around it. This show the logo but it still doesn't look right on mobile phones. Have you any other ideas? I know nothing about code so would be great if you could help me out. Plase mark the logo where it still cut off. What you want to do with the code which you had provided to me. If you use the logo on one of your test versions you will see that it cuts the logo off at the point where the demo ‘Dokan' logo ends. I would like you to look at this code and tell me if this might be a solution or if it is only going to break the website. Thanks! If you use the logo on one of your test versions you will see that it cuts the logo off at the point where the demo ‘Dokan’ logo ends. Please try the following style in themes/dokan/style.css and let me know the result. The topic ‘Header Questions’ is closed to new replies.